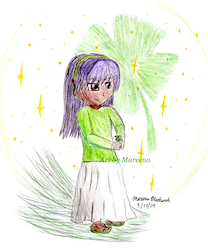 Anime style color pencil drawing of girl holding shamrock four leaf clover in hands. African American Irish anime girl drawing depicts large shamrock clover in the background. Staying with St. Patrick’s Day tradition to wear green or risk being pinched by peers, Shamrock Girl sports a green long-sleeved blouse over a white skirt and green sandals. A green hair band adorns her long dark hair just behind her bangs. Shamrock girl has large dark anime style eyes that match her brown skin tone.